Nicholas Ickle is in the wrong book. He is trying to introduce a book, but before he can begin the pages are invaded by other characters. He is interrupted one after the other—by an elephant, two monsters, a pirate, a queen and two servants, a horde of curious rats and a puppet. 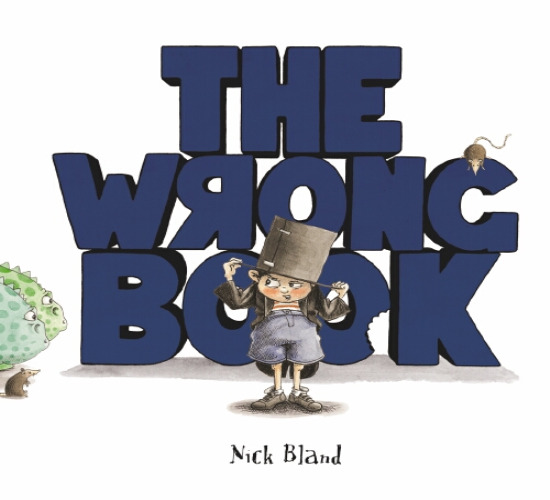 Nick Bland's humorous illustrations show Nicholas losing his temper and sending the characters away. Just as he tries to introduce the real subject of the book—himself—The End descends. Born in Lilydale, Victoria. Living at Wagait Beach near Darwin, NT. Straight As and several suspensions, one expulsion, one reinstatement. Not my best years. A Boy, a Dog and a Frog by Mercer Mayer. It was wordless and colourless but absolutely perfect. Who are your favourite children’s authors/illustrators? Shaun Tan and Chris Van Allsberg. What is your favourite food / colour / movie? Curry / Brown / Pulp Fiction. Who inspired you to write and illustrate? Maurice Sendak, Deb and Kilmeny Niland, Murray Ball (Footrot Flats), Michael Leunig, William Archibald Spooner. Worked in a bookshop, illustrated readers, worked hard on style and content then sent off an unsolicited manuscript called A Monster Wrote Me a Letter. Why did you want to be an author and illustrator? It is such a unique art form and one I believed I could become good at. I relax and wait for them to come to me. What is the best thing about being an author and illustrator? Have you had any funny or embarrassing moment as an author and illustrator? I once finished a whole book before I realised I’d done an extra page. Luckily it could be omitted without disrupting the flow of the book. What do you do when you are not writing or illustrating? What would you have chosen to be if you were not an author or illustrator? Herron of Alexandria. He invented two components of the internal combustion engine in about 60 AD but never got around to combining them. It would be another 1800 years until someone did. I’m colour blind. I see colours but slightly differently to most people.